The Assembly of First Nations (AFN) is a national advocacy organization representing First Nation citizens in Canada, which includes more than 900,000 people living in 634 First Nation communities and in cities and towns across the country. First Nation leaders (Chiefs) from coast to coast to coast direct the work of AFN through resolutions passed at Chiefs Assemblies held at least twice a year. The Canadian Aboriginal and Minority Supplier Council (CAMSC), certifies and links Aboriginal and minority owned businesses with major corporations. CAMSC promotes and facilitates procurement opportunities between major corporations and suppliers of all sizes owned and operated by Canadian Aboriginals and Minorities. CAMSC certification is a market access tool. Over the past seven years, CAMSC certified suppliers have secured more than $710 million in contract awards with Canadian and US corporations. Opportunities range in size from call centres, to printing & packaging and from staffing to trade contractors. CCAB builds bridges between Aboriginal and non-Aboriginal peoples, businesses, and communities through diverse programming, providing tools, training, network building, major business awards, and national events. Economic Development Officers (EDOs) need to be thoroughly trained, highly skilled and committed to building economic capacity in order to provide professional support and technical advice to their communities and organizations. In 1990, EDOs from across Canada founded and mandated the Cando to provide a national body to focus on the training, education and networking opportunities necessary to serve their communities and/or organizations as professionals. Cando (Council for the Advancement of Native Development Officers) is a federally registered, non-profit society that is Aboriginal controlled, community based, and membership driven. Cando is directed by a national regionally represented volunteer board of elected EDOs representing every region of Canada. Cando has been instrumental in facilitating partnerships with EDOs, academics, Aboriginal leaders and senior corporate and government representatives. Cando is unique because it is the only national organization that focuses on education and professional development for EDOs working in Aboriginal communities or organizations. Express Scripts Canada is one of Canada’s leading providers of health benefit management services. We are proud to serve private and public sector clients, including Indigenous Services Canada. As the provider of health information and claims processing services to First Nations people, we are committed to strengthen the Indigenous community and we will be champions for better. First Nations Health Managers Association is involved in expanding health management capacity for First Nations. The FNHMA provides leadership in First Nation health management activities by developing and promoting quality standards, practices, research, certification, networking and professional development to expand capacity for our members and First Nations. 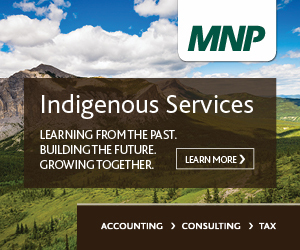 MNP is a leading national accounting, tax and consulting firm for Indigenous Nations in Canada. For the past 30 years, we have invested significant time and resources developing and delivering practical services for our clients. Serving Indigenous Nations, businesses and individuals across Canada, our team consists of 300 professionals that have a diverse set of experiences and services designed to position you for success. The National Aboriginal Capital Corporations Association (NACCA) represents a network of over 50 Aboriginal Financial Institutions (AFIs) located all across Canada. Our AFIs provide financing and support to First Nation, Métis and Inuit entrepreneurs. TD Canada Trust products and services include investing, insurance, banking and small business. Featuring TD Canada Trust EasyWeb online banking. T.E. Wealth’s dedicated Aboriginal Services team works with First Nations, Métis and Inuit communities by providing independent and objective advice in the development of investment, communication and financial education strategies.